The May 22, 2008 auction of American Paintings, Drawings and Sculpture at Sotheby's is highlighted by several very fine abstractions by Stuart Davis, rare paintings by William Sidney Mount and George Caleb Bingham, a "Peaceable Kingdom" painting by Edward Hicks, a wonderful painting by William Merritt Chase, a very good portrait by Thomas Eakins, an impressive work by Paul Cadmus and fine watercolors by Albert Jacob Miller and Thomas Moran. 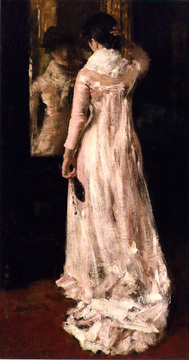 While auction has many works of high quality, the standout work might well be Lot 48, a smashing painting by William Merritt Chase (1849-1916) that is entitled "I Think I Am Ready Now (The Mirror, The Pink Dress)." Chase is widely celebrated as one of America's earliest and greatest Impressionist paintings based in part on his many landscapes in and around Shinneock on Long Island. Chase, however, was a fabulous painter of women, sometimes boldly as in an oil depicting a naked woman sitting in a chair and sometimes demurely in a classic portrait. This lot, which is from the collection of Gilbert A. and Anne B. Harrison, shows off Chase's bravura superbly. 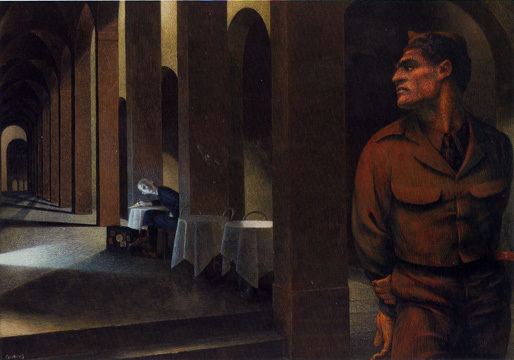 It was exhibited in the 1983-4 exhibition on Chase at the Metropolitan Museum of Art. It is also a wonderfully strong composition darkly framing the center glory of the pink dress and refraining from using a full-length mirror to show us the front of the beautiful lady. This is a glorious panting and has a very conservative estimate of $1,500,000 to $2,500,000. It sold for $6,649,000 including the buyer's premium as do all results mentioned in this article. The price far surpassed Chase's previous auction record of $3,962,500 set at Sotheby's in May, 1993. The auction was very successful with a sales total of $87,006,200 exceeding the pre-sale high estimate of $77,205,000. It was the second highest American Painting action ever surpassed only the December 2004 auction at Sotheby's that totalled $107,855,400. Lot 71 was commissioned in 1847 from William Sidney Mount (1807-1868) by Thomas McElrath, the publisher of The New York Tribune. Entitled "The Ramblers, it is an oil on canvas that measures 13 by 17 inches. 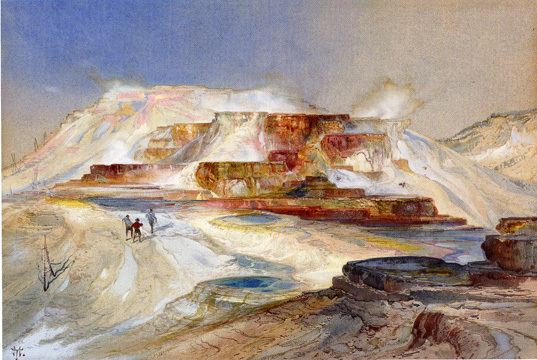 It was exhibited in 1847 at the National Academy of Design and is cited in three books on Mount. It has an estimate of $2,000,000 to $3,000,000. It sold for $2,381,000. Oil paintings by Mount are very rare and this would probably have had a much higher estimate if the face of one of the two girls in the picture was more visible. 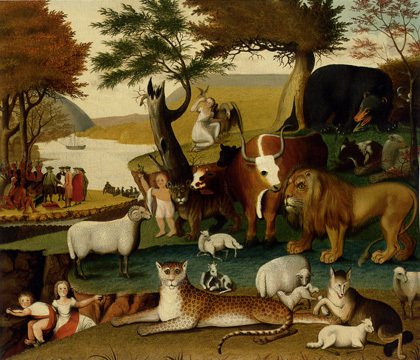 The most famous "folk" art painting in American art is "The Peaceable Kingdom" by Edward Hicks (1780-1849). Many similar versions exist. Lot 60 in this auction is a 26-by-29-inch oil on canvas by Hicks entitled "The Peaceable Kingdom with the Leopard of Serenity." 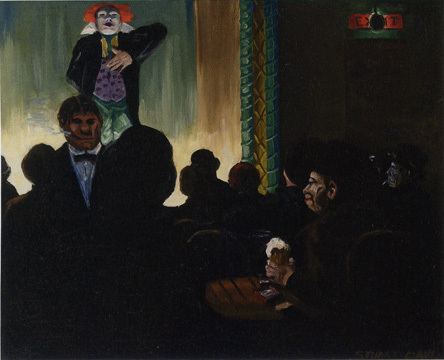 The work was exhibited at the Museum of Modern Art in the 1938 exhibition "Masters of Popular Painting. The lot has an estimate of $6,000,000 to $8,000,000. It sold for $9,673,000. 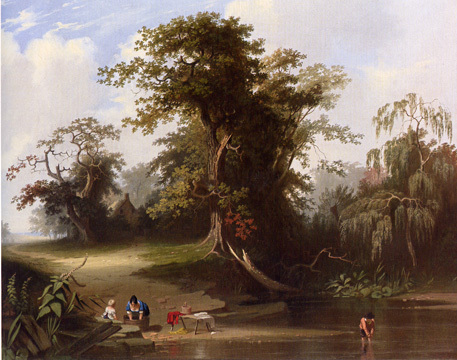 Lot 17 is an extremely charming and good landscape painting by George Caleb Bingham (1811-1879). An oil on canvas, it measures 29 by 36 inches and was painted in 1845. 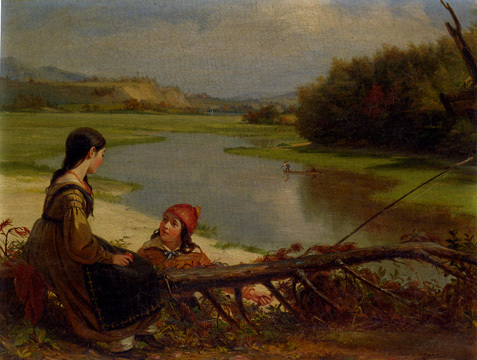 It was acquired from the artist in 1845 by the American Art Union. The lot has a very conservative estimate of $200,000 to $300,000. It sold for $493,000. Mr. and Mrs. George Fenmore Johnson have consigned two very fine watercolors by Albert Jacob Miller (1810-1874) to the auction. 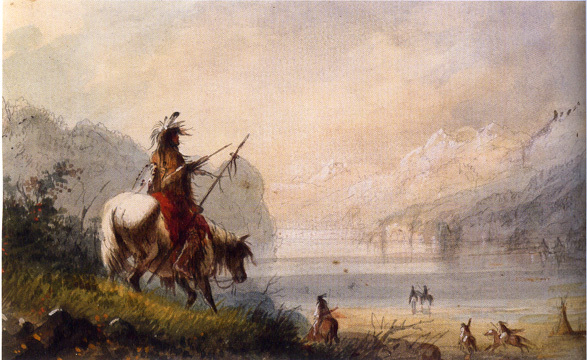 Lot 155 is entitled "Oregon Indians Water Horses" and measures 5 1/4 by 8 1/2 inches. It was belonged to J. William Middendorf of Washington, D.C. it has a modest estimate of $100,000 to $150,000. It sold for $121,000. 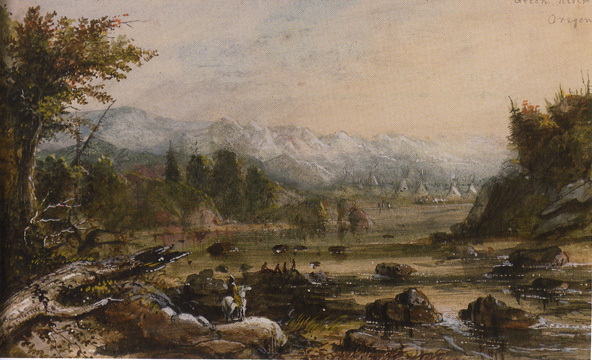 Lot 156, "Green River, Oregon," is the larger of the two Miller watercolors and it is a full composition with white-capped mountains and tipees in the distance and Indians by a river in the foreground. It measures 7 1/4 by 11 3/4 inches. It has an estimate of $150,000 to $250,000. It failed to sell. 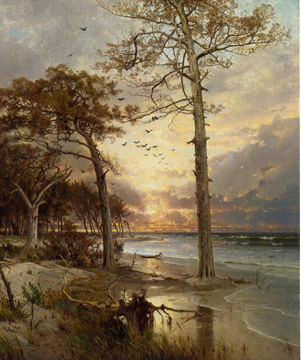 Lot 34 is a very beautiful oil on canvas by William Trost Richards (1933-1905), entitled "At Atlantic City," an oil on canvas that measures 25 by 20 inches. Executed in 1877, it was once in the collection of JoAnn and Julian Ganz of Los Angles. It has a modest estimate of $150,000 to $250,000. It sold for $493,500. Lot 38 is one of the marvelous portrait by Thomas Eakins in his own custom fashioned frames. 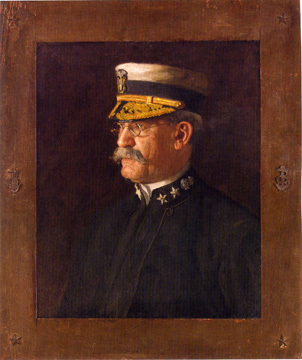 It depicts Rear Admiral Charles Dwight Sigsbee and was painted in 1903. An oil on canvas, it measures 26 by 21 inches. The catalogue entry notes that Sigsbee was "highly decorated and widely admired," and "is best remembered for the heroic and courageous measures he took to save the lives of his flllow officers as Captain of the U.S. Maine battleship when she exploded in Havana harbor n February, 1898; this attack was later identified as one of the major catalysts of the Spanish-Amercan war. The lot has a conservative estimate of $700,000 to $900,000. It sold for $1,945,000. Paintings by Charles Caryl Coleman (1840-1928) seldom appear at auctions and Lot 24 is a very beautiful example. Entitled "Azaleas and Apple Blossoms," it is an oil on canvas that measures 71 1/4 by 25 inches and was executed in 1879. It has an estimate of $500,000 to $700,000. It sold for $2,281,000. 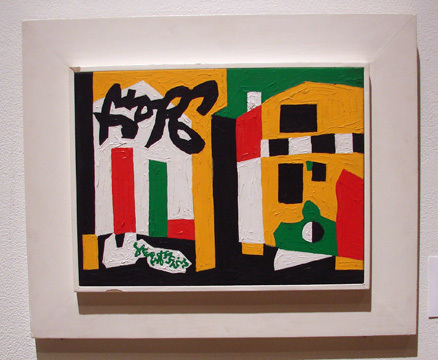 The Raymond and Patsy Nasher Collection has consigned three small but lovely abstractions by Stuart Davis (1892-1964) to the auction. The most colorful is Lot 111, "Rialto," an oil on board that measures 12 by 16 inches. 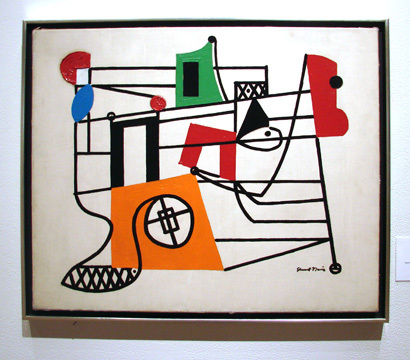 It is a fine example of the jazzy style that Davis created that is a fine mix of the rearrangements of Cubism and the flatness of many works by Matisse. The catalogue notes that between 1961 and 1963 Davis did a series of paintings inspired by a photograph in The New York Times of the medieval walls of Carcassone in France. This strong work is part of that series. It has a conservative estimate of $500,000 to $700,000. It sold for $629,000. Lot 115 is an oil on panel by Davis that is the same size of Lot 111 but somewhat subdued comparatively in the intensity of its palette while having a more complex composition. It was executed in 1933 and has a modest estimate of $400,000 to $600,000. It sold for $825,000. 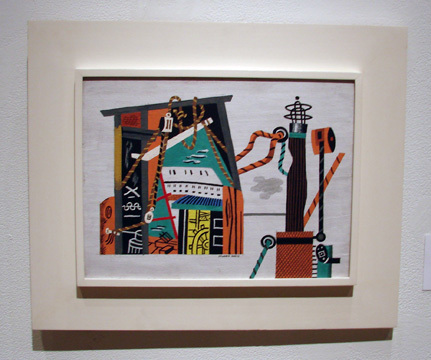 The largest of the three Nasher paintings by Davis consigned by the Nashers is Lot 123, "Composition with Winch," an oil on canvas that measures 22 by 27 inches. It was painted circa 1932 and has been widely exhibited. It has an estimate of $300,000 to $400,000. It sold for $825,000. Lot 45 is is a very good "Ashcan" work by Davis entitled "The Music Hall." An oil on canvas, it measures 26 by 31 3/4 inches and is dated 1910. It has an estimate of $500,000 to $700,000. It sold for $2,841,000. Paul Cadmus (1904-1999) is like Thomas Hart Benton one of the great individualistic stylists of mid-20th Century. Lot 110, "Notturno Bologna," an egg tempera on gessoed panel, is an intriguing 1957 work that is closely related to "Night in Bologna," a work executed in 1958 that incorporates this composition into a larger one that shows a woman at the right and places all the figures in the lower third of the painting. The changes in composition can radically alter interpretations of the work. In any event, the small work being offered in this auction has a remarkable sense of monumentality despite its small scale. The lot has a conservative estimate of $200,000 to $300,000. It sold for $277,000. The auction also included several bronze sculptures by Frederick Remington including "The Wounded Bunkie," Lot 171,which sold for $5,641,000, a record for the artist.